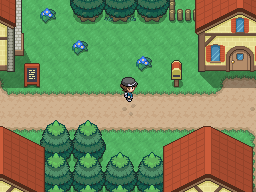 Hey there, I've been looking at some maps from the minish cap recently and decided to try throwing some tiles from it into Rpgmaker, in particular some indoor tiles. The parts directly from the minish cap are all the wooden parts, and all four walls are visible in this design. I think it will help to make indoor maps look a little more interesting. 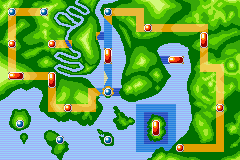 So, I was wondering if using this design for indoor maps could work in a Pokémon fangame without looking jarring, assuming the outdoor maps are still conventional. initially, the change from traditional indoor view to this is a little awkward, but I suppose its a style choice - however, the tile have different shading and stylistically clash - I would recommend simplifying the colors and shading on the new tiles to fit the pokemon style if you're serious about using them! The walls look to be at too much of an angle compared to the characters - it looks kinda weird. I agree, while the tiles themselves actually fit rather well, it appears that the chartacter on the map is either laying on the floor, or the walls are going up at an angle. I think it looks really great. A second character overworldsprite set will be needed though. I'm struggling on how to do this properly though, because a human from above is basicly a circle with hair/hat with mabe some skin and as such hard to differenciate from other characters and more important to recognize outdoor characters in indoor style. Mabe just make the body+face smaller and have a little more hair will fix this. If it doesn't there is definitly another way I didn't think of to solve this. Anyways ... 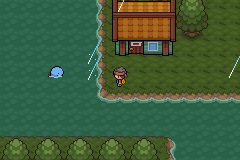 I'm a big fan of your idea just because I love the looks of your tiles and I think it would give your game anfreshing element that is different from other Pokémon games. Thanks for all the feedback! I switched to using gen 5 overworlds and they definitely fit a bit better even if they're not perfect. I'll certainly try and simplify the colours so the shading is more consistent as well. I have this here. Some of the tiles are custom (the buildings, post boxes, kiosk, lamps, grill, flagged ropes and decorations). What do you think? I'm not really happy with it, I don't know why. I really like it. The buildings are detailed and interesting. I'd agree with the earlier comments about filling the space up a bit - maybe move the grill and put little benches around it, connect the paths a bit more, and maybe put some NPCs outside just to make it look more alive? Edit- I looked at it a bit more and thought of another thing. You use a couple different types of roof styles.I think it could help it make the whole scene look more uniform if you swapped out the orange/grey sloped roofs with the grey/sunken/checkered roof style. I mean you could still use grey and orange colors, but it might look better if they were all the same shape (set in rather than sloped out), especially since the buildings have so much surface variation in other ways. Just an idea! As you can see, the roof is made of orange clay and sloped like that. Though I wasn't completely trying to remake it in pixel form, I was looking for a simplified version. Now the checkered roof is specific of the PokéMart, designed for a shop that's recognizable worldwide. You can already see the portuguese influences on the Center and Mart, but seeing as both are general to the whole world, I tried to make the buildings both recognizable and unique to the region, hence the overall architecture is very portuguese-heavy, but the roofs and coloration are more natural to Center (grey roof and not orange) and Mart (checkered grey). I quite like this, actually. It's nice and cosy, which I admire about it. I like the custom tiles and feel like they suit the theme of the map very well. I really like the flags, they make such a good addition to the aesthetic. I think it looks great! Ahh that makes sense now! Great inspiration and honestly, you've done a wonderful job of translating the intricacy of that architecture into pixel form. Pretty snazzy, If the critiques are only the tiles then the only thing I think is the computer, I feel like it could be better, another thing is I think there should be a different Sprite for the Nurse, she just looks out of place. Overall I think it looks good. 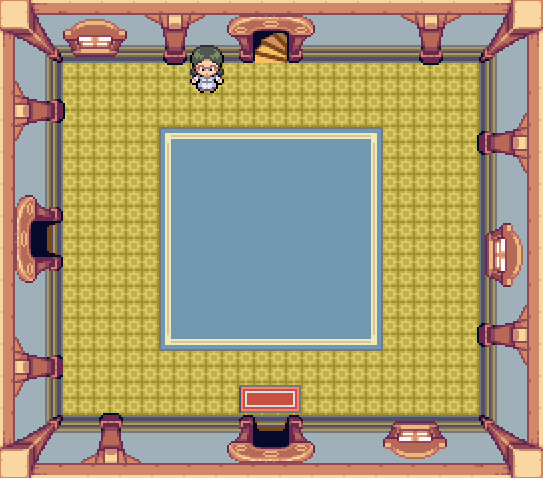 However I have some different critiques for the Pokecenter itself but it's unnecessary so nvm. They look good, but they feel like they're a different style than the OW's. The OW's have a bit of a harder shading, and have a bit of an outline whereas the tiles have a bit more of a smoother shading and seem to lack an outline. Notes: Some areas are only accessible via dive but one city would be accessible via a tunnel that would later be blocked. For some reason I really like the shapes, they really stand out to me and it's appealing, one critique I have however is just the little river on the left, it just looked a bit out of place, maybe simplifing it would help? Other then that I think it's fine. It's fine, I am not really a fan of the player sprite, it just looks off to me. I like the environment however, it looks gorgeous and I want to see more!